It was the 1st time I had breathed in so much fresh air at once. With mountains right in front of me, trees and roads way below, for those 45 minutes, I felt like a bird slowly making its way through a valley. 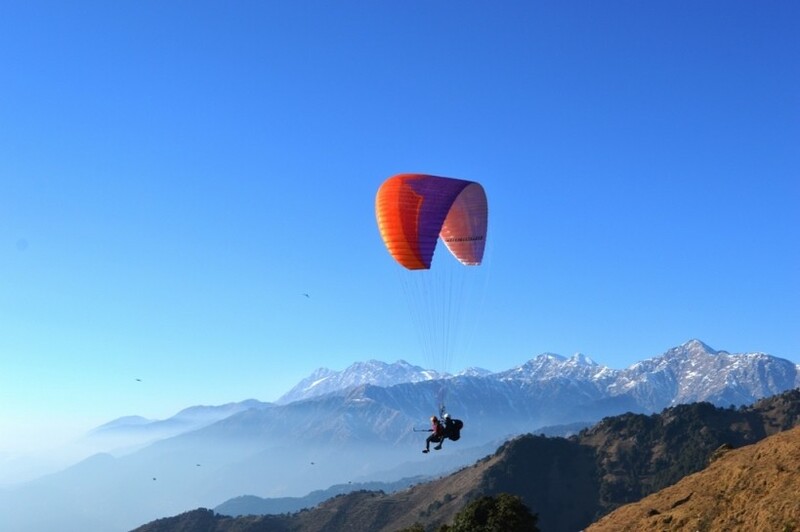 I had never heard of this place until last year when I was looking for ‘Adventure sports around Delhi’, and I came to know that it is the highest spot for paragliding in India, 2nd highest in the world at Bir-Billing in Himachal Pradesh. We were 4 of us and booked a package with one of the trekking/camping/gliding groups in Kangra – It included one day stay at their guesthouse with breakfast, a small trek from Bir and climb up to the flying point and gliding back down to Bir, all at INR 3,000 per person. You can also choose to stay in one of these cute tents at Bir and Billing. There is a variety of trekking choices available in the Bir-Billing valley, ranging from the really easy ones to those lasting 2-3 days, which include camping as well. Since all of us were beginners, we chose the basic option (5-6 hours of walking uphill through slightly rough terrains in a jungle). After all the hard work and empty water bottles, we were 2400 meters above sea level, too excited to fly down from Billing to Bir. After a series of conversation with the pilots, hearing a couple of inspirational stories, and while getting ready for the jump, I was almost convinced that it is completely safe and I really want to try it. The rest of it is just too difficult to put in words. That’s why we have pictures. Have you indulged yourself in this amazing activity? Please share your experiences in comments.